Welcome to Evergreen Bay Resort. Formally know as Fun Ta Boot. My wife Dawn and I (Bill) Williams are very blessed to now be owners of such a beautiful place. 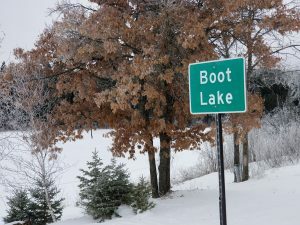 We welcome everyone to bring their friends and family to our cabin to enjoy the beauty of Park Rapids area and crystal clear Boot Lake. We offer 13 modern cabins, great fishing, sugar sand beach, 60 acres of hiking, biking and riding trails, all nestled with in a beautiful stand of evergreens. Even in the winter this resort is amazing!